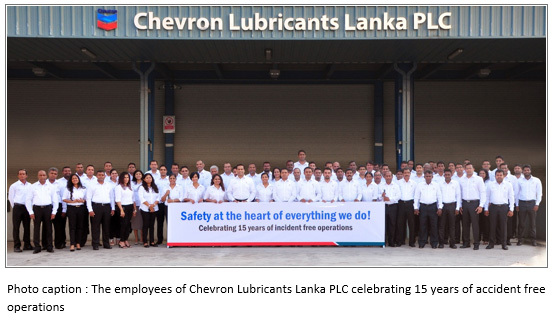 Chevron Lubricants Lanka PLC completes 15 years without work place injury extending the safety record | Welcome to Chevron Lubricant Lanka PLC. Chevron Lubricants Lanka PLC successfully completed 15 years of zero days away from work across the entire operation that includes the Base oil tank farm, laboratory, manufacturing, warehousing and distribution operation. This achievement is a testimony to the company’s world class safety culture that fosters the value of safety and well-being of its employees through awareness on safe work practices. In celebrating this significant landmark in the company’s performance, an event was held on the 24th of March 2017 at the Chevron’s Blending plant in Sapugaskanda. Well-wishers, stakeholders, media and the employees of the company were present at this event. Training employees on specific work activities and the use of tools to identify potential hazards and operating environmental risks to eliminate unsafe behaviour to prevent accidents at the worksites have paved the way to create this new record in Sri-Lanka. “The frequent use of Stop Work Authority (SWA) by all employees at all levels regardless of rank & file which is used to immediately stop & correct any unsafe behaviour as well as Management of Change (MOC) process tool are the corner stones of this success which also helps the business to achieve the highest level of productivity and efficiency. These tools helped us manage the risks associated with changes in the work environment, equipment or processes to identify the associated risks and eliminate hazards have contributed to the attainment of this safety record”, said the Managing Director, Mr. Kishu Gomes. Daily leadership walkabouts in the Chevron premises to identify and instantly address unsafe practices to improve & sustain the safety culture such as Stop Work Authority (SWA) has delivered positive results for the company from many angles. Recognising and rewarding employee’s safe work practices have helped Chevron instil the right mind set that drives the right actions. Chevron Lubricants Lanka PLC is extremely delighted with this 15 consecutive year long safety record and is committed to extend this record, to set an example to other business organizations in Sri Lanka. Safety is number one for us and we are glad that we have been able to set a new trend in Sri-Lanka for others to follow. We are happy to share the best practices with the industry should there be any requests for our assistance for the nation to embrace and practice this number one value in business said Mr. Kishu Gomes.